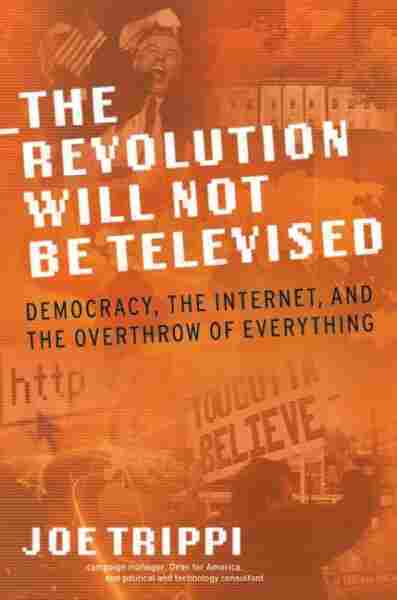 The Revolution Will Not Be Televised NPR coverage of The Revolution Will Not Be Televised: Democracy, The Internet, And The Overthrow Of Everything by Joe Trippi. News, author interviews, critics' picks and more. The former campaign manager for Howard Dean explains how he used the Internet to transform an obscure presidential candidate into a front-runner at the heart of a national grassroots movement. I was born right when everything started going to hell. It was 1956, full dawn of the television age, when the number ofhouseholds with televisions topped 75 percent and when, not coincidentally,American political and civic involvement was beginning its longdownward spiral. In my lifetime, television has become the dominant forcein American life, affecting every part of our culture. At the same time, itbegan to erode some of the political and social underpinnings of the greatestcivilization in history. If the Greeks were a people destroyed by hubris,the Aztecs by brutality, and the Romans by arrogance, Americans at theturn of the twenty-first century were a culture in danger of being ruinedby Must See TV. Television's impact has been so overwhelming, so insidious,that it is impossible for some people to imagine a world not dominatedby it, to believe that something new could rise up and break TV'sfifty-year spell of cynicism and powerlessness. We saw it when an army of nineteen-year-olds used Napster to bringthe recording industry to its knees. We're seeing it in corporate America,where small investors are beginning to band together on web sites andblogs to demand accountability from the companies they own shares in.We're seeing it with TiVo and American Idol and a flood of reality programming,as television desperately tries to remake itself in the image of the Internet. We saw it in China, where citizens used the Internet to gettheir government to confront the AIDS epidemic and in the Philippines,where demonstrations organized by text messaging drove out the presidentof the country. And we saw it most recently, in the United States, in Howard Dean'sinsurgent bid for the presidency. For twenty years, people have been calling this era of computers, theInternet, and telecommunications the "information age." But that's notwhat it is. What we're really in now is the empowerment age. If informationis power, then this new technology — which is the first to evenly distribute information — is really distributing power. This power is shifting from institutions that have always been run top down, hording information at the top, telling us how to run our lives, to a new paradigm of power that is democratically distributed and shared by all of us. I believe that what we do with that power will determine the courseof this country. I believe that the Internet is the last hope for democracy. Ibelieve that Americans will use it in the next decade to bring about a totaltransformation of politics, business, education, and entertainment. Personally, I can't wait. But then, I've always been the kind of person who thrives on change, the kind of person who runs headlong into things I don't understand ... even those things that scare me to death. Ever since I was a kid, I've had this recurring nightmare. In the dream,my friends and family are frantically telling me that I have to get on an airplane.They won't tell me why, but they are adamant that I do it: "Yougotta get on that plane. It's important. You have to get on that plane." I was seven or eight when I f irst began having this dream. It was sovivid, so real — and it was the same every time: "You gotta get on thatplane." In the nightmare, the same thing always happens: the plane sputtersand rocks and eventually goes into a dive, hurtles toward the ground, andblows up in a big f iery explosion. As befits someone who wakes up everyother morning having just died in a plane crash, I grew up terrified of airplanesand of flying. I think that most people, when confronted with this kind of phobia, would find a way to avoid flying at all costs. Not me. I became obsessed with flying. Maybe as a way to conquer my fear, I learned everything I could about planes. I learned why they fly, how to take them apart, and how to put them back together again. I spent hours hunched over models. I read every book and magazine about planes that I could get my hands on. I went to the airport to watch planes take off andland. When I was old enough, I got jobs at airports working around planes. And, eventually, I chose a career that meant I'd be on airplanes most of my adult life. In the end, I believe this is the only effective way to deal with an irrational fear like that — to put your mind to work on the problem, to turn the fear of flying into an understanding of it, a sense of wonder at the miracle of human flight. I understand the fear of communication and information technologies. I know there are corporate and political leaders who, to this day, refuse to acknowledge the immense and mostly untapped potential of the Internet. I know why you belittle technology, why you call the Internet a fad, why you comfort yourself by believing that we left all that nonsense behind in a speculative stock bust. I know what motivates you to say that it costs too much, that it's going to open the world up to newproblems, that if you jump too soon into this new technology, you'll fall out of the sky.